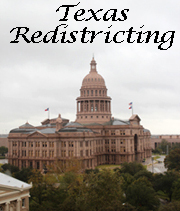 Republican Party of Texas - On Friday afternoon, the San Antonio three-judge panel issued an order which clearly indicates that the Court wishes for both sides in the redistricting lawsuit to assist in resolving all of the issues in time for an April primary election. The Court also clarified some misconceptions that have appeared on blogs and among the media - specifically, reports which have stated that the Court had rejected Attorney General Greg Abbott's proposed maps earlier this week. The order clearly states that the panel has not rejected any maps. The Court also noted that final interim maps would be drawn in accordance with the Supreme Court's recent ruling - "...which include the rather flexible standards of review that may be applied on one hand and the restrictive language regarding the creation of new coalition districts on the other hand." The RPT interprets this to mean that the Court is signaling to both the State of Texas (represented by General Abbott) and the various plaintiffs' groups, that it may be in the best interests of both sides to reach an agreement since utilizing these criteria would mean that probably neither side would get completely what it wanted anyway. The "flexible standards" referenced by the Court, indicates that they still have the ability to alter the legislative maps and still comply with the Supreme Court ruling (which is to the Democrats' advantage). On the other hand, the Court notes that the Supreme Court struck down the Democratic proposition that new coalition minority districts should be created (which favors the legislature's version of the maps). The Court issued additional orders requiring all sides to continue negotiations and to be prepared to discuss them at the hearing in San Antonio on February 14th and 15th. Advisory to all Republican county chairmen, precinct chairmen, and party activists - As the Party believes that this order increases the likelihood of a primary in April (probably in mid to late April, we urge everyone to continue to make preliminary plans for a primary around April 17th. The odds of this happening will become much clearer by mid-week. There is an article in the Austin American Statesman, today, February 14, 2012, that again does not tell the real story about this issue, because, of course, we are talking about The Statesman. There are several groups suing to revise the maps so that more Hispanic (Democrats) would have “an opportunity” to elect more of their own. With the new District 35, there is a good opportunity for that District to elect an Hispanic Democrat, except for one obstacle: Lloyd Doggett, the current incumbent in District 25, which has been revised by the Legislature. Doggett, according to the Statesman, has said that if the revised District 25 remains as redistricted by the Legislature, then that “would force him to run for reelection in District 35,” which is based in Bexar county, but does include parts of Austin, along IH-35. Excuse me, but when did this debate become about saving the personal skin of Mr. Doggett? If District 35 remains as drawn by the Legislature, chances are very good for an Hispanic Democrat, maybe from San Antonio, to run in the primary for that seat and probably beat Doggett for the nomination. For many, many years, throughout Texas, it has been Anglo Democrats that have stood in the way of letting Hispanic Democrats run for elective office where the Hispanic Democrats would have a good chance of being elected. Well, is that NOT discrimination? Will liberal newspapers like The Statesman ever write that story?